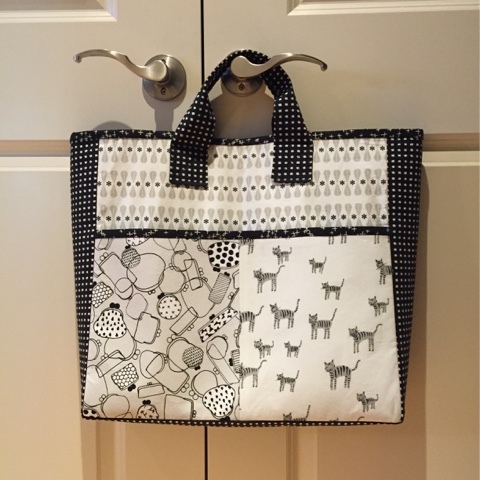 I've seen the Boxcar Tote pop up on my Instagram feed a few times, but I didn't really pay much attention until I saw the kit on Craftsy. Though I love Rashida Coleman-Hale's Mochi collection, I didn't want to use the same fabric as the kit, so I ordered the pattern directly from Alexia Abegg's site, greenbeepatterns.com. I hoarded some of Alexia's Tiger Stripes canvas print before using it in a couple of other bags lately, and I really love it. So, I opted to use the same print paired others with from Cotton + Steel's recently released Black & White collection. I've nicknamed this the "A Few of my Favorite Things" bag because it has kitties (yes, I know they are actually tigers) and bags. As with most bags or quilts, I dug into my stash of Aurifil thread. This time I used their 40wt thread in colors 2311 and 2692.
print for the lining, all fabric is from the collaborative Black & White collection. There are a bunch of things that I really like about the pattern, and a few that I was less keen on, so let's start with the good. I like that you can really feature several prints that you like. Even a larger scale print could work. It's also a great size. The instructions are straight forward, and this is a project that would be pretty beginner friendly. I also liked that the instructions gave the option to install a magnetic snap (which I did). As with many other bags, once I got all of the fabric cut and interfaced, the pattern was quick to sew. I'm not super keen on Pellon 809 (Decor Bond). It is a firm interfacing that is still lightweight and thin, so it doesn't add bulk (which is a good thing). I don't like that it tends to show creases. So, if I decide that I want to make the bag again (which I can totally see myself doing), I would consider swapping out and using something like Soft and Stable or Pellon 971 (Thermolam fusible needled fleece) which will help the bag to hold its shape and stand on its own (like it does with the Decor Bond). I also didn't like that all of the pockets, especially the interior pocket, are all wide. That's an easy enough fix, so I just sewed a line of stitching to divide the inside pocket prior to assembling the lining. very visible in the photo, but it's obvious that I need to press the lining fabric desperately. Other than adding the extra line of stitching to the interior pocket, I also top stitched next to the seam on the front and rear pocket just because I liked how it looked. My thread blends in very well, but up close, I think it's a nice bit of detail. I did not divide the pocket, the top stitching was done before the pocket was attached to the main part of the bag. I would make a couple of recommendations to somebody that is going to make the Boxcar Tote that I don't remember seeing in the instructions. 1. The type of construction used to assemble the bag has you stopping at a marked dot. 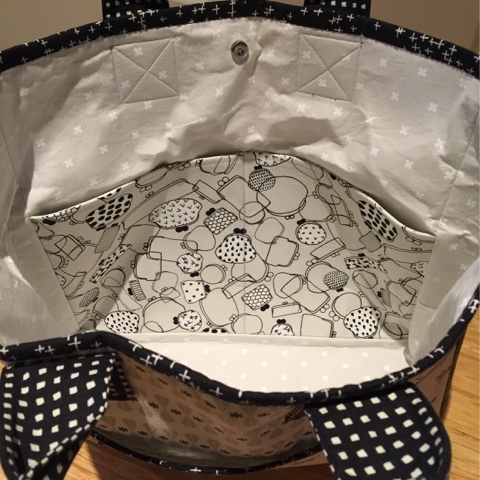 To make the finished bag's corners less squishy looking, you can clip off the points of the triangles being VERY careful not to cut any of the stitching. You just want to remove some of the bulk from the corners. I did this on both the exterior and the lining. Again, you only want to remove some of the bulk, so you don't need to take off very much fabric. 2. Similar to my first recommendation, clipping the corners on the strap piece before you turn it will make your corners more sharp. 3. If you are adding a magnetic snap, I'd recommend using an extra piece of firmer interfacing like Peltex or Soft and Stable to increase durability and stability of the prongs. Before cutting the holes for the prongs, I'd also recommend a tab of a product like Fray Block or Fray Check to keep the slots from growing or fraying. Let's see.... the other thing that I did was hand stitch the binding on the top of the bag (I did machine stitch the pockets). I prefer the cleaner finish where it is more visible. I could also see myself doing a version with a modified strap so that the bag could be shoulder carried (I would probably start the straps at the bottom of the main panel and attach them prior to sewing the front and back pockets on). I think my dream version of the bag would include changing the interfacing from Decor Bond to Soft and Stable and either stitching a line to divide the large front pockets or adding a snap closure to keep them shut. I'm noticing that sometimes they do gape open. Anyway, not a super long review of the Boxcar Tote from Green Bee Patterns, but I did quite enjoy making the bag. I would not hesitate to recommend this pattern. A very comprehensive review and tutorial. Thanks Girl. I think I can try this out with some minor changes in the structure. Will share my creation on pinterest. I really like the design of this tote bag. Thinking to get these packaging bags then, get these from Degage Corp which is the store for the Anti Static Cleanroom Bags and Tubing and to store all the stuffs at one place.